Use Organic Shea Butter daily to help alleviate many common skin problems. Vitamin A in Shea Butter is important for improving a number of skins conditions, including blemishes wrinkles, eczema, and dermatitis. This luxurious Shea butter is naturally pressed and unrefined. Shea butter is a popular in the natural body care and cosmetic industry. Our Shea Butter is Non GMO and contains no artificial fillers or ingredients. Compare and see the difference between Organic Shea Butter. This super-rich and creamy Body Butter is a feast for the skin. It melts straight in to leave skin feeling soft and smooth. It contains Community Trade Shea Butter and has a delicious nutty scent. Absolutely fantastic product- especially for the money you get a big 25 lb box will last a whole year and give out to friends and family. When I first purchased this product, I was skeptical to how well it was going to work on my skin. I was very much pleasantly surprised. This shea butter is a fantastic moisturizer that you can literally use from head to toe. The smell is pleasant but I wouldn't say divine. The texture is quite firm, so heating it up by placing the container in hot water, or even placing a very small amount in the microwave for a few seconds makes it much more spreadable. As for how well it works- it is probably one of the best moisturizers I have ever used. A little goes a very long way! I am still shocked that this amazing product is as cheap as it is for a big box. I've noticed a dramatic difference in the softness of my skin and have even noticed some of my scars have also faded with repeated use of this product. Love this shea butter! It's authentic, smells lovely & natural, has no added dyes. It has a very beautiful lovely color, and a creamy smooth consistency. I use it on my skin allover, including my face occasionally. My husband likes it when I use it on his eczema as well. Makes your skin so soft & nourished. We buy it in bulk and make products for the entire family and friends. Everyone loves the Mudfarm Shea Butter. The price is very good for this organic product. Simply the best shea butter we have ever used. Very pure and not hard and clumpy like other brands. Our moisturizers and creams come out amazing with lots of compliments from our customers. Shea Butter is the best quality in Toronto by far. Easy to buy and deliver or stop by the warehouse. Quality is very pure and organic and very good pricing for organic shea butter. Fresh and works so well to make my soap and creams. Saves me money and i don't have to worry about getting sick from thousands of chemicals. Thank you very much for all the shea butter, black soap and other products. Your oils are also wonderful, the castor oil. This Shea Butter is the Real Deal ! Excellent product. I purchased this 25 lbs of shea butter to make my own body butter and creams. (I have multiple contact dermatitis issues and can no longer trust factory produced lotions.) I made my first batch this weekend and the shea butter worked perfectly with the other ingredients and my skin feels amazing. I now have perfect moisturizing body butter for my dry sensitive skin. My skin and I are very happy. I have put this product on my subscribe and save list as I will be making my own moisturizers from now on. If you have DIY aspirations, this is the shea butter for you! I highly recommend this shea butter brand its very pure and their oils are of excellent quality for sure. Very happy i found mudfarm. The shea butter is the best quality every compared to other companies. This is ever better than new directions in my opinion and on amazon who knows what you are getting. When i go to the store these guys take good care of me. Will keep refering and ordering products. Go natural is the way and you won't get sick . Great Shea Butter and order in bulk to save. very nice quality. very smooth. I have tried some other Shea Butter brands but i find mudarm to have the best quality shea butter in Canada. Thank you very much! I am using this religiously to help with dry skin and eczema and its working bigtime. I can't see myself not every using this, its very addictive and smooth to apply. Very happy Mudfarm customer. Excellent Quality Shea Butter. Very smooth and easy to work with. Using this product for all of my projects. Using it daily now and i am receiving lots of comments on my skin. Highly recommended.. The shea butter is especially helpful for dry spots on my children's skin in the winter as well as for lips. Also, it is long lasting - one need not reapply it often. I love products like this that have no fragrance and are organic and non-irritating. Tops! I found Mudfarm Organix online over three months ago shortly after making the decision to get into soap making. I wanted only the finest ingredients to go into my final product , to achieve this, I did an extensive amount of research into not only the materials that would be required but also the people that would supplying the products needed for me to achieve this. I contacted them by Email and shortly after had the pleasure of chatting with them by phone, at this time I placed my order. At this point after receiving excellent feedback from people who have used my soap, I felt it was now time to send in a complete review to Mudfarm Organix . Well, let's just say that I could not have made a better choice. I give them 5 Stars across the board, and am looking forward to doing business them again. Thank You. I would like to thank you for sending our first order, yes our First, as quickly as you did. And thank you so much for the gifts. As for the Coconut Oil, I like both the feel and taste and would be interested purchasing it in bulk, could you send me a quote on larger quantities, please. This particular shea butta is thicker than other brands and you have to work it in, and once you get it going its amazing smell and qulity very worth the price for sure i use this from back home in Gana. 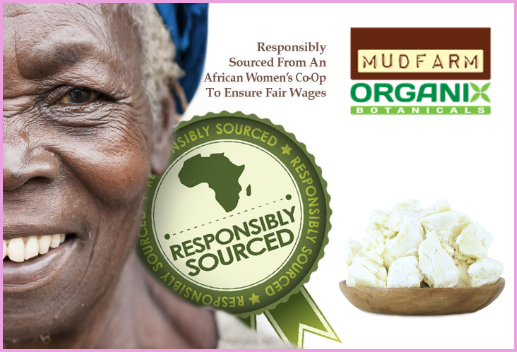 I absolutely adore the Pure Shea Butter and i used the walmart brand and it not as pure as this fair trade company. The coconut oil was really nice as well. I have been using it post-pregnancy and can't stop using it for 4 years now. It is especially good in the winter, as my skin gets extremely dry. I love this product! I used loccitane brand before, but find this much better and cheaper in my opinion. I use it on my daughter every day, she has a lot of skin problems. She is 4.5 and I have been using it on her for 2.5 years now. We call it her Magic cream as it soothes and takes away her problem areas and irritations. I've read horror stories about buying shea butter online. However, this shea butter was nice and thick. It was also free of dirt and bugs (which other companies have). Great product overall. First time trying shea butter and black soap. Its great my skin feels very clean when using the soap. Will continue to use it for my Acne and Blemishes. Wonder if the Cocoa Butter works the same way. Click the button below to add the 25 Lbs Organic Shea Butter Box to your wish list.